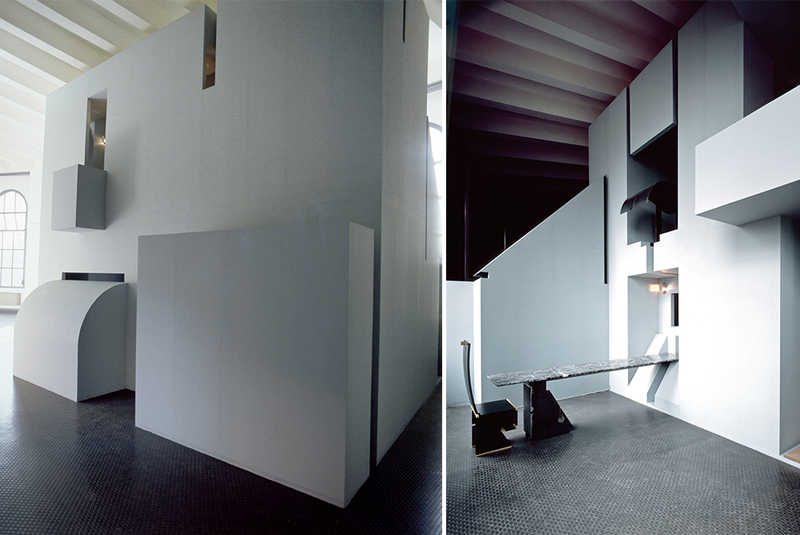 George Ranalli Architect created the installation Living In A Loft for the 17th Triennale di Milano, “Il Progetto Domestico,” January 18 – March 30, 1986. The project explores ideas about residential architecture, interiority, adaptive reuse, and urbanism. The prototype ‘building’ adapted a space inside a vast gallery originally constructed for industrial use. 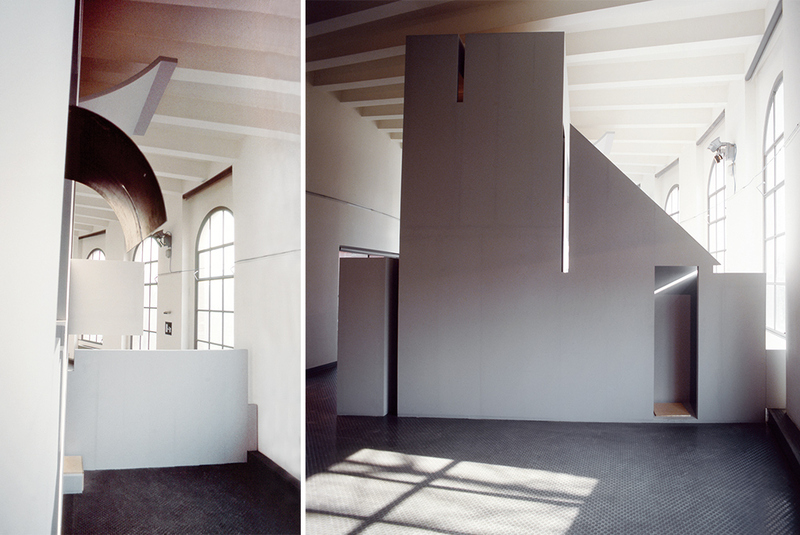 George Ranalli Architect’s 1986 installation,”Living In A Loft,” constructed a habitable, three-level form inside a vast gallery in the city of Milan, Italy. 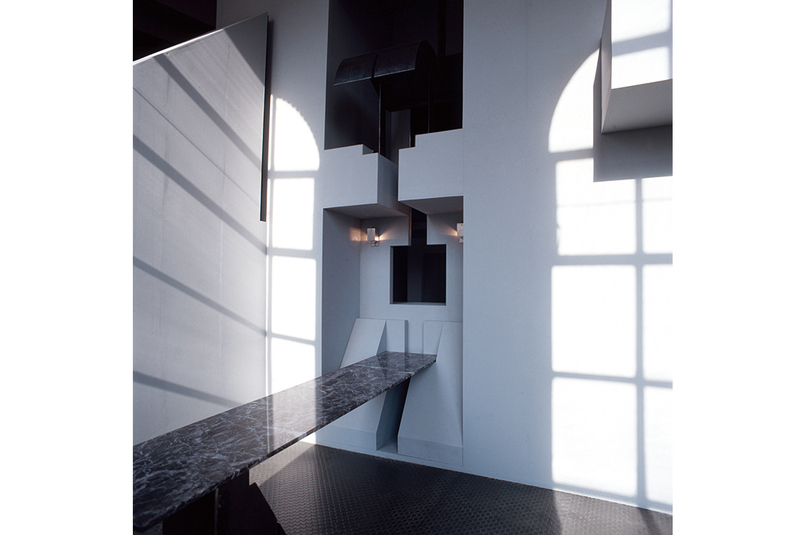 The sculptural structure shaped and molded space, inside and around itself, for a modern dwelling. Upon approach, inside the old shell, “Living Loft” looks like a solid enclosure. However, once “inside,” the structure carved and molds space for all the basic functions of home life, including eating, sleeping, and socializing. Visitors able to circumnavigate each levels of the little building explored a nontraditional house, accommodating the everyday rituals of eating, sleeping, socializing, and contemplating. The installation included a long table, two types of chairs, storage, and a place for sleeping. By eliminating the traditional division of rooms, the architecture gave way to niches, nooks, and balconies, rooms within rooms, and delightful vistas. Through surface modeling and adjustments of proportion, the installation managed to grant even a tiny alcove a sense of particularity. 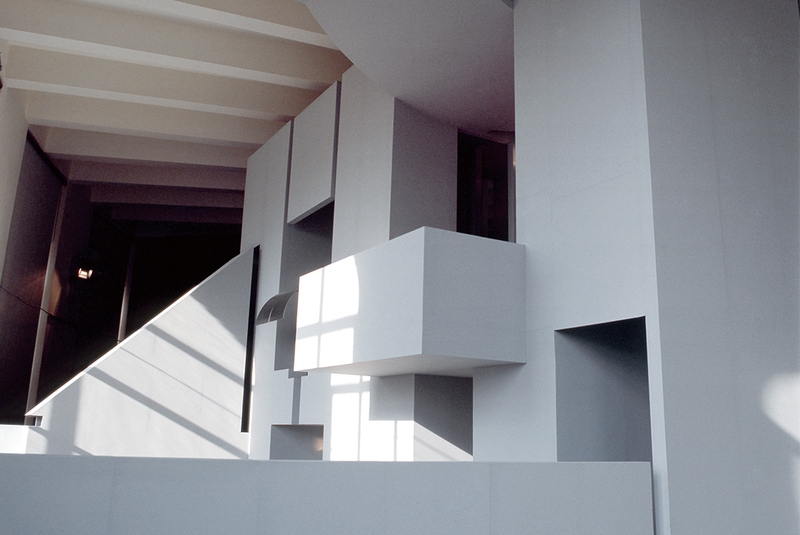 “Living loft” also proposed a new sense of domestic materiality, chosen for appeal and durability alike. A surprising set of combinations, some not fully housebroken, like welded sheet steel paired with marble and brass, presented a modern interpretation of elegance, and debuted a dining chair, Valentine 1 Chair, for Promosedia, which, together with an unusual, one-legged marble table design, formulated a rather elegant dining space inside its host structure, inside the gallery, in the city.